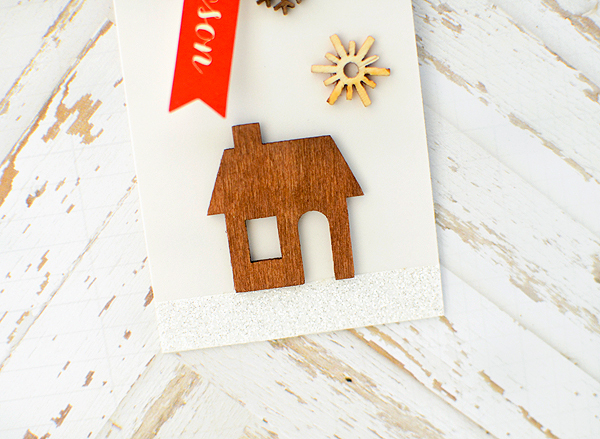 back today with another Festive Friday project. i went a little rustic this week, inspired by the pine branches, snow-covered house, and kraft-wrapped packages from the inspiration photo. 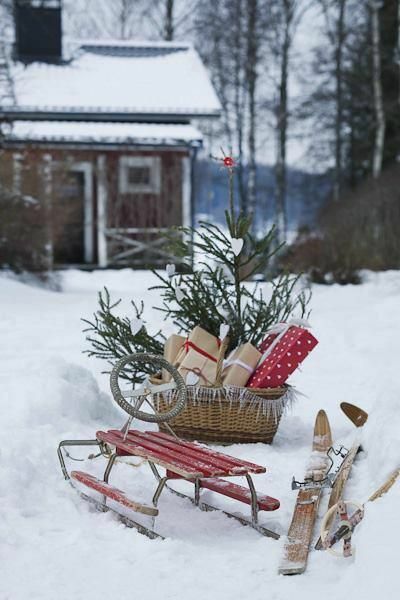 there were so many Christmas-y, wintry subjects to choose from in this beautiful composition and i'll admit that i found it difficult to pick only one! so i picked several and made a set of tags to highlight them. wood shapes are the common feature here--you know the drill; i love them to pieces. 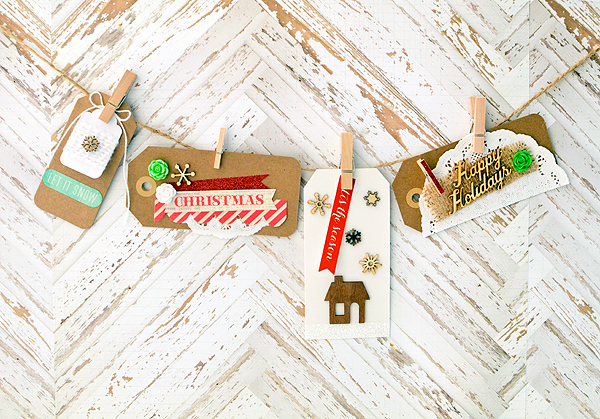 and there aren't too many things more rustic than wood, which is why i included at least one shape on each tag. i chose elements in red, white, and bits of green to break up all the brown of the kraft tags. 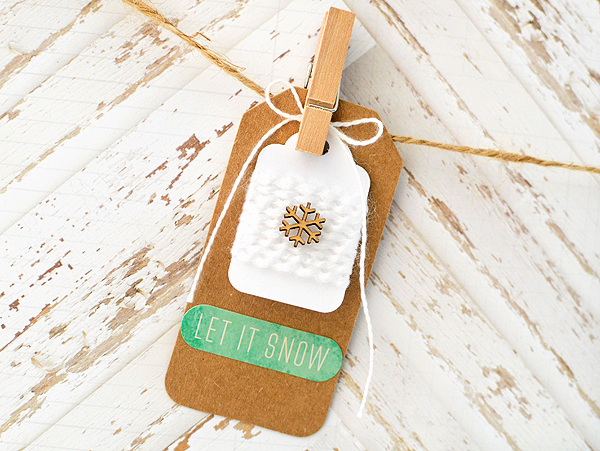 the white doilies and tags are reminiscent of snow and brighten up the project. 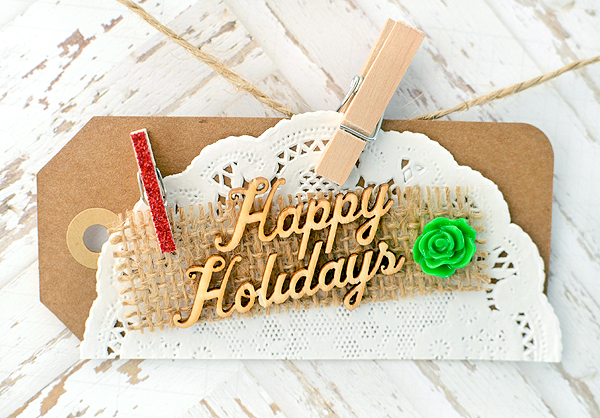 there are stickers from Crate Paper's Christmas lines and the "Happy Holidays" wood veneer is Cosmo Cricket. 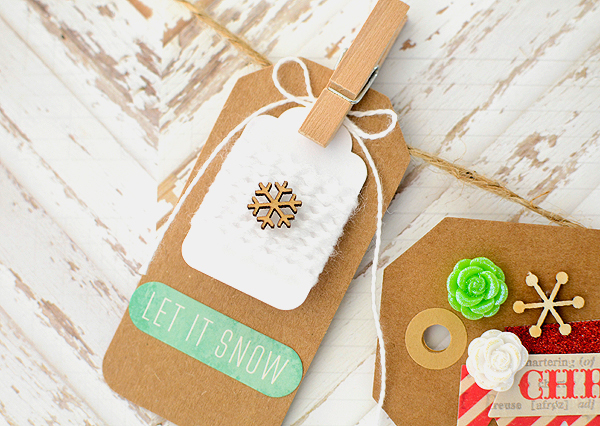 one of my favorite things to make around the holidays are "cozy" tags; that is, yarn-wrapped tags. i just take soft, fuzzy yarn and wind it around a tag several times, then tie it off in the back. the same technique works with most trims; baker's twine is another of my favorites to use. it's very easy to do and when i use yarn, it reminds me of a warm, cozy sweater--hence the term, "cozy tags." 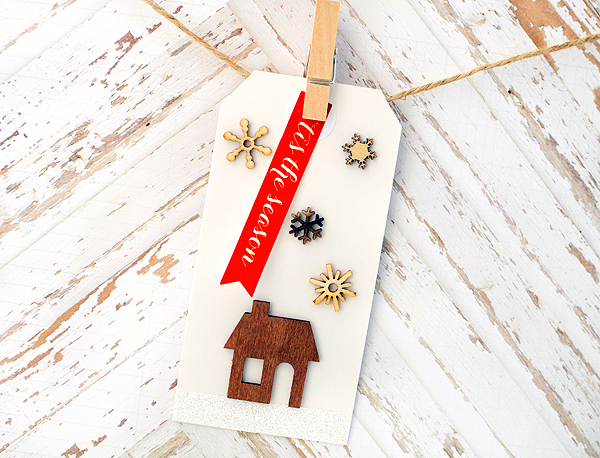 in the background of the inspiration photo there is a house and i liked the idea of making a winter scene on my tag. i used a wood house from CP's Close Knit line and various snowflakes to make it look like it's snowing around the house. the red banner sticker is a welcome pop of color. it's a bit difficult to see in my photos, but there's a strip of white glitter below the house, mimicking a bed of sparkly white snow. i do hope you all get a chance to play along with this challenge--there are some very pretty cards by the design team this week--so please stop by and check them out. have a terrific weekend! Oh I LOVE them. What a sweet collection of tags! So cute Rebecca! 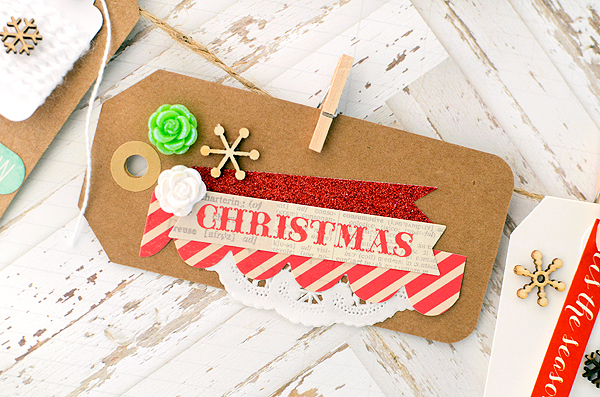 I love how there an tags, love the burlap, its fantastic!